housing market and keep home loan rates low. push them dramatically lower in the future. future inflation could have a negative effect on mortgage rates. rates. Home loan rates remain within inches of ALL-TIME historic lows. Waiting is a risky move. clients to get off the fence and buy! The Commerce Deparment reported(.pdf) that housing starts rose for the first time in eight months, up 22.2 percent in February from record lows in January, largely as a result of a rebound in condominium and apartment building. "I DO NOT THINK MUCH OF A MAN WHO IS NOT WISER TODAY THAN HE WAS YESTERDAY." Abraham Lincoln. Now more than ever, it's important for our country's leaders to heed yesterday's lessons and make wise choices today for our banking system and the economy. There were several key developments that happened on this front last week - here are some highlights. On Thursday, the Securities and Exchange Commission's (SEC) Chief Accountant, the Financial Accounting Standards Board's (FASB) Chairman and the Deputy Comptroller for Regulatory Policy in the Treasury Department testified in front of the House Financial Services committee on the "Mark-to-Market" accounting rule. This rule was created so that there would be more transparency in business dealings, but fell prey to the law of "unintended consequences", and has played a major part in our current financial crisis. If you've been receiving this newsletter for awhile, you know this has been discussed several times - and we've even sent you a great explanatory video that breaks down what it all means, and why it has been such a major issue. Because so many of you have been asking about this topic and great video - I am including the information and video once again in this week's issue - keep reading for the full scoop in the Mortgage Market View article below. During Thursday's hearing, Congress demanded an answer for repairing this situation within the next three weeks, so right now, it looks like we will see some sort of coordinated action by both the FASB and the SEC to address the Mark-to-Market situation soon. Stocks certainly reacted positively to this news last week, as well as to Citigroup's announcement that it will not need more TARP money from the government. Stocks also liked the remarks from Federal Reserve Chairman Bernanke that the recession would be over by year-end if the banking situation is stabilized, and that major financial institutions would not be allowed to fail. In other news, the Retail Sales numbers for February came in better than expected and the numbers for January were revised higher. This report is very volatile from month to month, but the last couple of readings have been encouraging. However, the job market continues to struggle as the number of people receiving unemployment reached a record 5.32 Million. And there was news that China is concerned the US may be spending too aggressively on the recession, which could lead to inflation down the road that would diminish the value of Bonds and China's investments in the US. Overall, Bonds and home loan rates didn't worsen last week - even with the huge Stock rally - and ended the week relatively close to where they began. The middle of this week will be action packed with both scheduled economic reports and the Fed's next regularly scheduled meeting, including their policy statement and rate decision being delivered on Wednesday. With all the actions the government has been taking to stabilize our economy, it will be especially important to hear what the Fed has to say.and to see how the markets react. This week also brings news on the inflation (or deflation) front, with Tuesday's wholesale measuring Producer Price Index (PPI) Report and Wednesday's Consumer Price Index (CPI) Report. Given China's concerns mentioned above about US spending to combat the recession and what that could mean for inflation, it will be important to see how these reports come in. 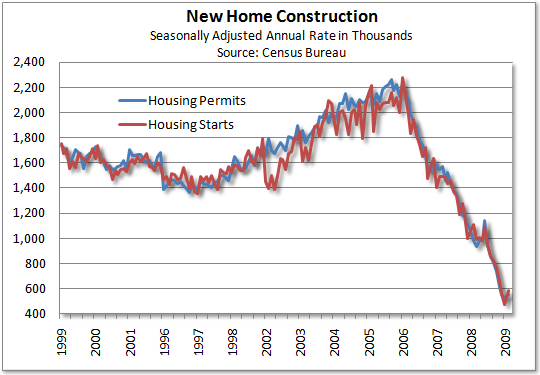 Also this week, we'll get a read on the new construction housing market with Tuesday's Housing Starts and Building Permits Reports. On Thursday, the Philadelphia Fed Report will be released. This monthly survey of manufacturing purchasing managers conducting business around the tri-state area of Pennsylvania, New Jersey, and Delaware is one of the most-watched manufacturing reports. We'll also have another Initial Jobless Claims report on Thursday, and with the number of people collecting unemployment reaching record highs as mentioned above, it will be important to keep an eye on this report, too. Remember: Weak economic news normally helps Bonds and home loan rates improve, as money flows out of Stocks and into Bonds. As you can see in the chart below, Bonds were helped by important technical support and were able to hold onto recent gains even with the rally in the Stock market. I'll be watching closely to see how Bonds and home loan rates react to all of this week's events! The current economic crisis is the top news story for nearly every media outlet. But until recently, one of the most important factors that led to this challenging market has also been one of the least discussed. By popular demand, I am again sending along this highly sought after video and article, unpacking the "Mark-to-Market" accounting issue - with some help from Barry Habib. Barry is a highly respected expert on home loans, who serves as Chairman of MSS, an organization that helps me to stay informed as your trusted advisor. With the help of some easy-to-understand terms and illustrations, you will learn what it has taken the media and politicians many months to take seriously and begin to address.